The issue of retention of original windows in preservation, and lately, in sustainability, has always been one of extreme importance. It is commonly asked where the evidence is to defend retention of original windows, and how to respond to efforts to replace them. There is a prominent replacement window industry advertising the energy efficiency and lack of maintenance required for new windows, but no one to promote the appropriateness and energy efficiency of a properly maintained original window. Occasional maintenance is required of a historic window; they were built with maintenance in mind. New windows are “no maintenance” because when they break, they have to be replaced. Maintenance is not possible for a modern window. Lately, window replacement has been incorporated into third party voluntary certification providers and codified in new energy efficient building codes. To their credit, some third party certifiers are beginning to acknowledge that repaired windows have equal value to replacement windows in their point rating systems. Building codes include a "performance" method for analyzing the performance of the overall building envelope, as opposed to the "prescription" method that focusses on the performance of individual parts. Many studies objectively demonstrate the viability of repairing original windows. Some of them are collected here. All of the studies conclude that original window repair and other conservation strategies provide similar energy benefits of a replacement window, with less impact to the environment as an existing resource. This article from Ms. Rocchi of savingplaces.org discusses how historic windows often get the blame for a building’s energy loss. Most often, people consider replacing their historic windows because companies promise that their replacement windows will save clients time and money, and it’s promoted as sustainable. 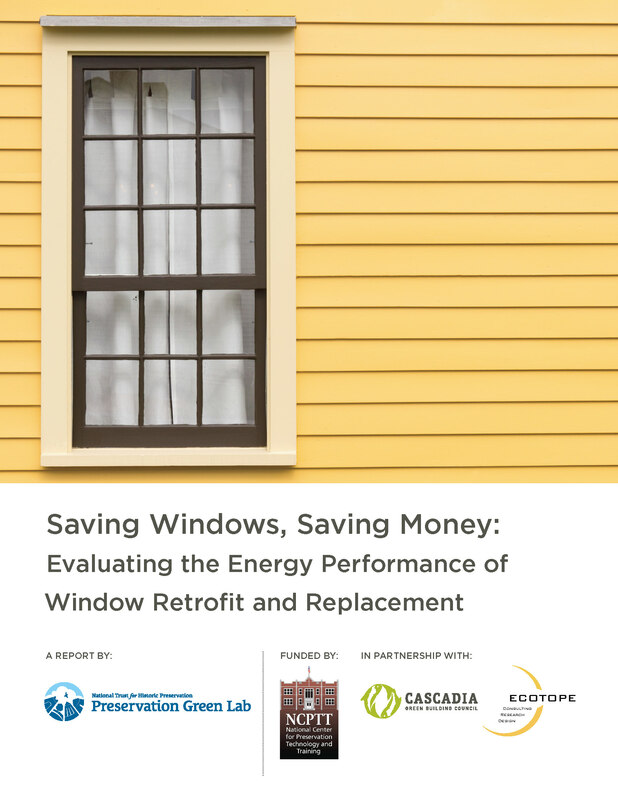 Ms. Rocchi promotes their report from Preservation Green Lab in Seattle, "Saving Windows, Saving Money: Evaluating the Energy Performance of Window Retrofit and Replacement" (reviewed below) and also shares the top 13 things you should know about retrofitting historic windows. The article includes a slide show, which is shared here. A report produced by the National Trust for Historic Preservation Green Lab provides cost guidance for homeowners weighing the financial and energy tradeoffs between replacing or repairing older, less efficient windows. This report, "Saving Windows, Saving Money: Evaluating the Energy Performance of Window Retrofit and Replacement", builds on previous research by examining multiple window improvement options, comparing them to replacement windows across multiple climate regions. Saving Windows, Saving Money’s key findings offer homeowners, contractors, architects and others with compelling evidence of the merits of retrofitting windows as opposed to outright replacement. Retrofit measures can achieve performance results comparable to new replacement windows. This study shows that there are readily available retrofit measures that can achieve energy savings close to new, high performance replacement windows when the performance for each upgrade option is taken into account. Almost every retrofit option Offers a better Return on Investment (ROI) than replacement windows. Findings from the cost analysis showed that new, high performance windows are by far the most expensive measure, costing at least double that of common retrofit options when considering materials, installation and general construction commonly required for an existing home. In all climate zones analyzed, cellular shades, interior storm panels and various exterior storm window configurations offer a higher average return on investment compared to new, efficient replacement windows. The Bottom Line. Retrofitting windows with high performance enhancements can result in substantial energy savings across a variety of climate zones. Selecting options that retain and retrofit existing windows are the most cost effective way to achieve these energy savings and to lower a home’s carbon footprint. Retrofits extend the life of existing windows, avoid production of new materials, reduce waste and preserve a home’s character. In the Fall of 2010, the top preservation trades people in North America and Europe met for the International Preservation Trades Workshop in Frankfort, Kentucky. Five window experts, Duffy Hoffman, John Leeke, Jim Turner, David Gibney and Bob Yapp met and decided it was time to create national standards for the repair and weatherization of old and historic windows. The WINDOW PRESERVATION STANDARDS COLLABORATIVE was conceived. Using cutting-edge window testing technology, the Collaborative's tests are verifying "what most people in historic preservation have known for years, old and historic windows can cost effectively be made as or more energy efficient than new, disposable replacement windows." The Collaborative recently published a manual for the assessment and preservation of historic wood windows, reviewed below. The national Window Preservation Standards book catalogs specific methods for the assessment, maintenance, repair, preservation and weatherization of older and historic wooden windows. Many detailed methods, procedures and materials are included, as well as basic strategies for saving older and historic windows. The Standards were developed and written by more than 100 window specialists who collaborated from all across the United States and Canada. The results of energy performance testing done at the 2011 National Window Preservation Summit are included. It confirms what is already known: Save the primary sash and frame, add weatherstripping and a storm to make the window meet or exceed current performance standards for air infiltration. All the details are in the book, including which energy upgrade methods worked best. 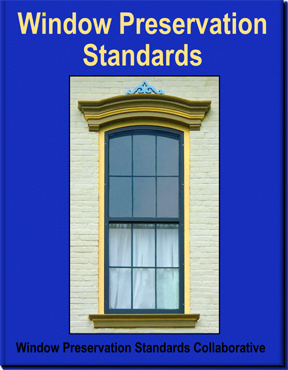 The Window Preservation Standards book is a non-profit project done in partnership with the Preservation Trades Network, Kentucky Heritage Council and Kentucky Preservation. Ordering information can be found here. "Window Repair, Rehabilitation and Replacement" , Peter Baker, P.E. This study focused on empirical testing of the energy efficiency and economy of a range of options for upgrading the energy performance of historic windows. The study involved retrofitting windows in a test home in a historic district in Boulder, Colorado. It included testing in a window laboratory facility developed for the study. Technical Paper 1 tested the use of curtains, shutters, blinds, and secondary glazing. All were shown to reduce the heat loss through the glazing to varying degrees. Secondary glazing was found to be the most effective overall option, as it reduced heat loss through the window by 63%. Timber shutters are the most effective option of the traditional methods, reducing heat loss by 51%; curtains reduced heat loss by 14%; a Victorian roller blind reduced heat loss by 28%; a modern roller blind reduced heat loss by 22%. The greatest reductions in heat loss came from combining these measures (i.e. blinds, shutters and curtains all closed) and by adding extra insulation to these options. Technical Paper 20 remeasures the efficiency of previously installed slim-profile double glazing in existing historic windows. Technical Report 23 assesses the effectiveness of two inexpensive and minimally invasive methods for improving the thermal performance of single glazed windows. This technical paper demonstrates that a range of options, including minimally invasive and inexpensive methods, can play a worthwhile role in the overall thermal improvement of buildings. Window Energy Analysis, Keith Haberern, P.E. “Replacement Windows and Furnaces in the Heartland: Indiana’s Energy Conservation Financial Assistance Program” by William H. Hill. This is the 1990 study that demonstrates a four hundred year payback using replacement windows. “Measured Winter Performance of Storm Windows” by J. H. Klems. This Berkeley storm window research focuses on north-facing storm windows using low e glazing. It uses rigorous scientific analysis to conclude that no difference is found in performance between the low-e storm with an original window and a low-e replacement window. “Building Regulations and Historic Buildings: balancing the needs for energy conservation with those of building conservation” The English Heritage Interim Guidance article touches on all parts of preservation and conservation of power and fuel, and the chapter on windows is very relevant. “Repair or Replace Windows in Historic Buildings: Arriving at a Sustainable Solution” The Heritage Canada file contains two articles, one from Andrew Powter and Craig Sims discussing how to arrive at a decision to replace or repair original windows, and Susan Turner explains the sustainable nature of window repair rather than replacement. "The Effects of Energy Efficiency Treatments on Historic Windows" is an empirical study recently completed by the Center for Resource Conservation in Boulder Colorado. The study involved retrofitting windows in a test home in a historic district and investigated and then compared the energy efficiency and economy of eleven different preservation treatment options with that of new vinyl windows. Most of the proposed treatments were able to outperform a new vinyl window. Energy conservation studies conducted for Indiana's Energy Conservation Financial Assistance Program by Dr. William Hill, professor of Urban Planning at Ball State University, found that it would take 400 years to recover the initial cost of replacement windows in fuel savings. “Life Cycle Of Window Materials - A Comparative Assessment” by Asif, Davidson and Muneer. A comparative life cycle assessment of the environmental impact of different window materials is included for its interesting materials energy cost analysis. “Domestic Retrofitting Strategies in the UK: Effectiveness vs. Affordability” is an interesting presentation of the effectiveness of different energy retrofitting strategies, including shutters. “What Replacement Windows Can’t Replace: The Real Cost of Replacing Historic Windows” Walter Sedovic and Jill Gotthelf provide an excellent discussion of the comparative value of window replacement versus repair. Many aspects of sustainability are considered. “Testing the energy performance of wood windows in Cold Climates” by Brad James, Andrew Shapiro, Steve Flanders and Dr. David Hemenway is a thoroughly researched paper that concludes that historic windows should not be replaced for energy considerations alone, as retrofitted and replacement windows perform similarly. “Lincoln Hall Windows Research Report: A Case Study of Options for Treatment for Windows at Lincoln Hall, University Of Illinois, Urbana Champaign” This report provides empirical data to assess window repair or replacement options for a proposed LEED Gold project, addressing the existing windows in terms of energy consumption. "Old Windows Find a Following" by Katie Zezima. New York Times 7/27/2011. “Windows Aren't Always A Clear Path for Savings: In Quest to Boost Energy-Efficiency, Small Changes Might Have Bigger Payoff” by Terri Rupar. Washington Post 5/16/2009. “Thinking Of New Windows? Save Your Energy” National Public Radio (NPR) 10/11/2009.